We define dignity because it’s the one noun that relates to quality of life at the end of life, a core value of hospice care at Hospice of Southern Illinois. How do people with a life-limiting illness find quality of life at the end of life? Finding it is different for each person. As individuals with life-limiting illnesses disease progresses, Hospice of Southern Illinois can be called in to support the patient and their family. We know it’s not an easy call to make. Our care team works together with the patient and their family on what matters most to them at the end of life. While Hospice of Southern Illinois offers many services, layers of support, and compassionate care providers, our core values: integrity, excellence, respect, dignity, and diversity, remain the same. Quality of life is at the center of everything we do for our patients and their families. Mr. David Ward’s story is an example of care that focuses on the quality of life. Mr. Ward was in the hospital, his kidneys failing, and physically ill. His disease was end-stage. The doctor recommended hospice. Our admission nurse arrived to provide education and support. Mr. Ward and his daughter, his healthcare power of attorney, decided they needed to refocus his goals of care. Quality of life was now his primary focus. Within Mr. Ward’s first week of receiving hospice care, his pain was reduced and his symptoms were managed. His daughter was surprised to see her father living past a week. She focused on the time she had to spend with her dad. “As far as I am concerned, these are the angels sent down to help me take care of my daddy.” His nurse and hospice aide, who assisted with his physical well-being, personal care and diagnosis specific education, visited him regularly to ensure his dignity as his disease progressed. Mr. Ward is a man with so much history; born in 1941, an Army veteran and a gunshot victim while saving his brother 45 years ago. After learning so much about Mr. Ward’s life, his social worker began to ensure the emotional well-being of the family. Often checking in, providing resources, and preparing them for the unknown ahead, the social worker also enjoyed Mr. Ward’s many stories, love for coffee, chocolate cake donuts, and old western films. Mr. Ward and his family have seen how meeting with hospice to discuss his comfort and peace was a decision they will never regret. Calling Hospice of Southern Illinois to focus on his quality of life early on, was such a benefit, not only to their dad, but to the entire family. We hope every individual and their family who experience a life-limiting illness can spend time with family, focus on what’s important each day, and receive the dignity they deserve. To learn more about our programs and services, click here. To make a referral or ask questions without obligation, call 1-800-233-1708. The 2019 National Association of Social Worker’s theme is “Elevate Social Work.” Hospice of Southern Illinois takes this opportunity to highlight Hospice Social Workers and Bereavement Counselors for the work they do. Social Workers and Bereavement Counselors are part of the hospice care team focusing on the emotional and spiritual well-being of patients and their loved ones. Social Workers play an active role in providing care to patients. They provide education, offer emotional support, promote communication, and connect individuals to available resources. Bereavement counselors ensure families have tools and additional support they may need to cope with the loss of a loved one. These services are offered for 13 months after a loved one has passed and can be helpful in their healing. Want to help thank them for their work? Share these images through the month of March, Social Work Month, to spotlight all Social Workers and Bereavement Counselors, especially those in hospice care. Don’t forget to use the hashtag #ourheartbeatsburgundy! To read about our care, click here. 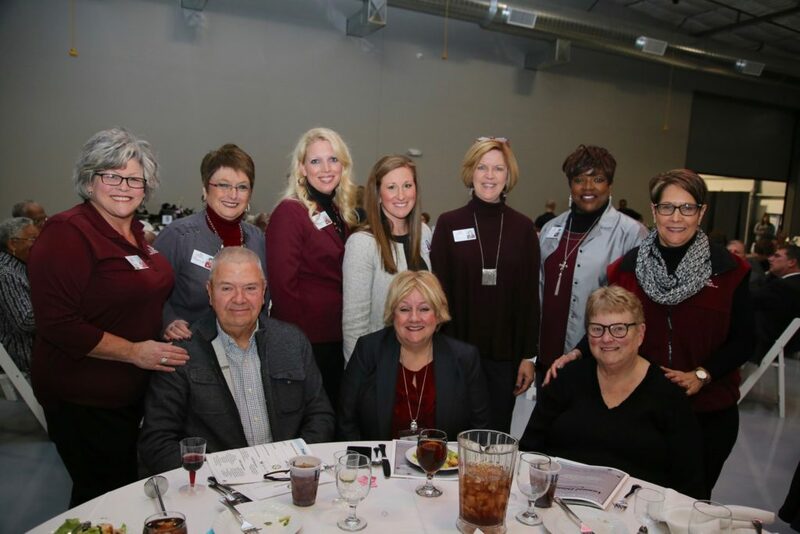 Hospice of Southern Illinois takes pride in the integrity of our reputation and the involvement in the communities we serve. Below are a few ways Hospice of Southern Illinois made an impact in 2018. We are looking forward to 2019 and growing to serve you better each year, keeping our mission in the forefront: to enhance the quality of life for individuals and their loved ones touched by a terminal illness. Served over 40,000 families since 1981– we are your local, not-for-profit hospice with our roots starting right here in Southern Illinois. Celebrated our 37thyear of serving our communities – Hospice of Southern Illinois is the leader and has experience in end-of-life care. Welcomed Hanna Hollingsworth as our new PGY2 (post-graduate, year 2) Pain and Palliative Care Pharmacist – Hospice of Southern Illinois’ Pharmacy Residency Program, in collaboration with the SIUE School of Pharmacy, remains the only accreditedPGY2 Pain and Palliative Care Pharmacy Residency Program fully funded by a hospice, in the United States. Purchased a new building – located at 333 South Illinois Street, Belleville, IL. This will be the future home of our Belleville Clinical Team, moving from their leased space on East Main Street to the new building in the Fall of 2019. This building was chosen because of its proximity to our administrative office (next door) and for growth opportunities. Achieved We Honor Veterans Partner, Level Four – showing our dedication to Veteran End-of-Life care, our Belleville Location received the highest recognition, Level IV, of the We Honor Veterans Program. Our Marion location previously received this recognition. Marion Honor Flight – Hospice of Southern Illinois’ volunteers served on the Welcome Home Committee for Veterans Honor Flight Volunteer Group. Over 250 volunteers were involved to make the Veterans’ Homecoming memorable. More than 3,600 people welcomed these Heroes Home at the Veterans Airport of Southern Illinois. Hosted 4 Virtual Flight of Honor programs– together with community leaders of Waterloo, Freeburg, Swansea, and Mascoutah, Hospice of Southern Illinois honored over 80 Veterans. Members of the communities also came out to experience the typical “honor flight day” without leaving their hometown. Reached 4,000 Likes on Facebook– we are your resource for hospice education and news locally. We appreciate the online support of our advocates, patients and communities. Launched our Instagram account – visually opening our arms to show you the hospice hearts of those who provide the care and programs in the Metro East and Southern Illinois. Reinstated Pet Therapy Program – our pet therapy program is a complimentary service and an extension of our mission. We focus on finding ways to bring comfort and peace to patients and their loved ones. Pet therapy has the power to offer additional support while adding joy, companionship, social interaction, and emotional connection to individuals at any stage in their end-of-life journey. Volunteers donated over 10,000 hours– individuals came together and shared their time and talents with patients, families and employees to support our mission. 8% of volunteer hours were in direct patient care– Medicare requires a minimum of 5% of volunteer hours in patient care. Our dedicated volunteer teams exceeded this requirement. Presented and hosted over 160 presentations– we offer presentations, education, and resources at a minimal or no cost to healthcare professionals, organizations and community groups. Collaborated with community organizations – Belleville Area Humane Society, Shoeman Water Project, Boots and Socks for Trinity United Church of Christ, Mimosas and Mittens at The Esquiline and a Food Drive. Participated in Empty Bowl Luncheons – over 2,000 community members attend these community-based lunch programs raising awareness and offering networking where local businesses give back to local organizations. Involved in Salute to Scott – this O’Fallon-Shiloh Chamber celebration welcomes Scott Air Force Base residents, veterans and community members to find fellowship through a welcoming community event. Guidestar Silver Seal – we proudly display a Silver Seal on the GuideStar Nonprofit Profile to show a commitment to transparency with our supporters. GuideStar is the world’s largest source of information on nonprofit organizations. With a Silver Seal, Hospice of Southern Illinois’ visitors can make more informed decisions when considering a donation. Verified Non-Profit on Facebook – individuals can give back and make donations directly to Hospice of Southern Illinois through social media. Thank you to our Facebook family, supporters, advocates, and donors who helped raise over $4,000 in our first verified year! The mission of Hospice of Southern Illinois is to enhance the quality of life for individuals and their loved ones touched by a terminal illness. Part of the whole hospice philosophy is improving quality of life. Below are 7 ways hospice care can improve an individual’s quality of life at the end of life. Focuses on comfort and quality of life which often includes stopping or decreasing painful procedures, tests, and hospitalizations. Allows patients to leave their home to go on outings and participate in day-to-day activities, as tolerated, as long as possible. Provides control of pain, nausea, shortness of breath, and other symptoms by initiating new comfort medications, discontinuing some medications that may be causing unwanted side effects, and adding medical equipment. Hospice is all about living life to its fullest. Hospice helps people with life-limiting illness focus on living life as fully as possible, for as long as possible. If you need more information on how Hospice of Southern Illinois can support your loved one, or just have questions to see if we can help, please don’t wait. Peace of mind matters. Contact us early to see how the hospice philosophy can help improve an individual’s quality of life. No one has to go through the dying process alone. There comes a time, to ask how hospice can help. Hospice of Southern Illinois is a not-for-profit hospice program serving 27 counties in southern Illinois since 1981. It’s very important to explain when to call Hospice of Southern Illinois. Calling hospice to learn about the programs and services we provide as individuals’ health declines can provide education and a possible plan for comfort and peace as the end-of-life nears. The time to learn about hospice services is before individuals think it is needed, because often times, individuals could have been benefitting from services for quite some time. When an informational is provided or an evaluation is completed, individuals can decide if hospice is the right choice for them. Hospice is an option and service with comfort front of mind. We are here for additional support, when the time comes. Ask how hospice can help speak with a nurse or social worker today, 618-235-1703 or 618-997-3030. Not ready for a call, access free resources today, www.hospice.org/community/.